If OECD members empowered each of their young workers, the overall economy could be over $1 trillion better off. Recent research by PwC shows that youth participation in the labour market varies dramatically among OECD countries. 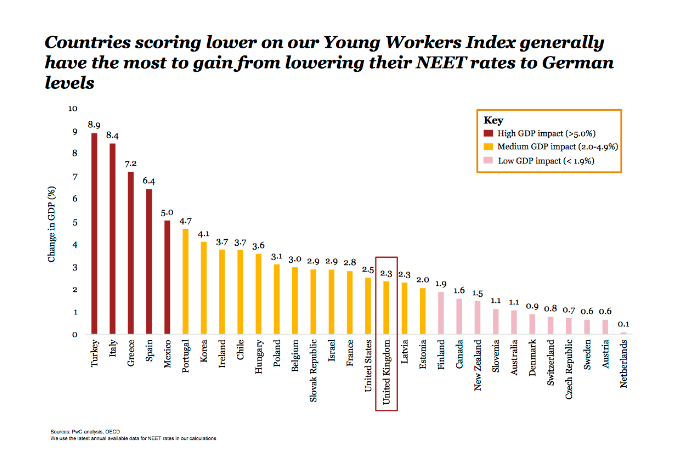 PwC has compiled a Young Workers Index , which measures how well OECD countries are developing the economic potential of their young workers over time. The index looks at eight indicators that reflect the education and working patterns of people aged between 15-24 in 35 OECD countries. This includes things like NEET rates (the number of 20-24 year olds not in education, employment or training), various indicators about employment, school drop-out rates and educational employment rates. 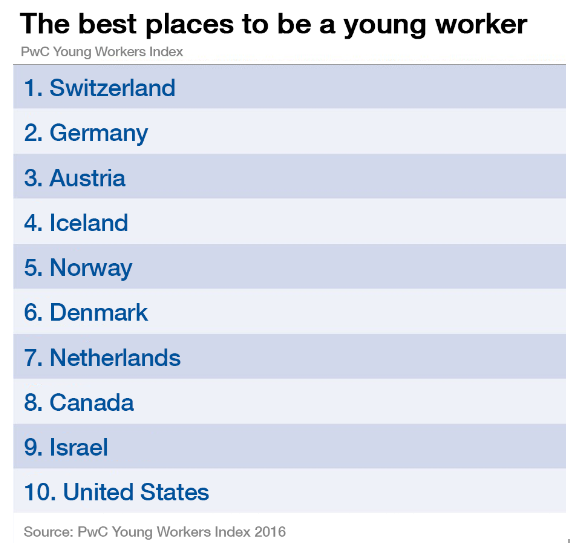 Switzerland, Germany and Austria top the list, having the most youth empowerment. The Nordic countries perform strongly with Iceland, Norway and Denmark taking the next three spots. The Netherlands, Canada, Israel and the United States complete the top 10. However, in almost a half of all the OECD countries, one in four young people were unemployed for over a year. Spain, Greece and Italy scored low on the index, in 32nd, 33rd and in last place (35th) place respectively, although most of the southern European economies improved their performance between 2014 and 2015, apart from Italy. The UK and France came in 21st and 26th respectively. When young people aren't empowered, it has a negative impact on productivity and government finances, but it also has long-term implications for the real-life opportunities of young people and the communities around them, says the report. 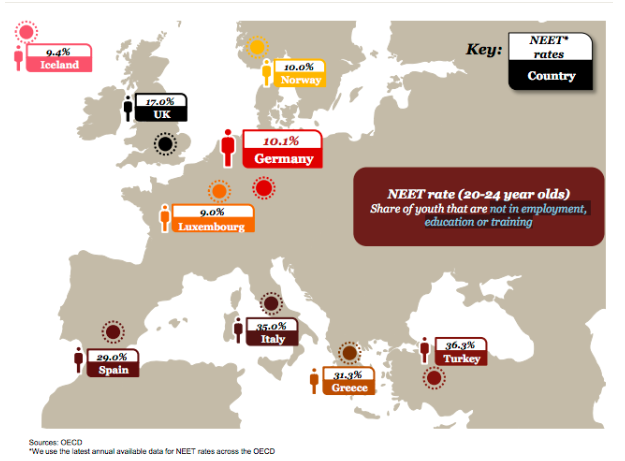 NEETS The report argues that, if all nations in the OECD drove their NEET rate down to match that of Germany, the OECD GDP could be boosted by over $1.1 trillion. The share of NEETS varies dramatically among OECD nations. Germany's share is 10%. Spain, Italy, Greece and Turkey register at least three times that amount, at 29%, 35%, 31.3% and 36.3% respectively. Luxembourg does better at 9%, as does Iceland with 9.4%. Norway equals Germany at 10%, but the UK does worse at 17%. Those with the highest NEET score would gain the most from a reduction in NEET rates, says the report. Italy and Turkey, for example, could experience the largest economic gains of around 8-9%. For the countries with NEET scores similar to Germany, like Austria and The Netherlands, the gain would be lower. Austria and The Netherlands would register only a 0.6% or a 0.1% gain. It's a question of policy The question of course, is how can countries reduce their share of NEETs? High performers have various things in common, according to the report. First of all, they promote vocational training alongside classroom learning. In addition, those that include employers in the design of the vocational training are more successful. The top three performers in the index, Switzerland, Germany and Austria, all have a strong focus on vocational training alongside school. Secondly, they have employers talk to schools. By showing young people what opportunities are out there, and by showing businesses what potential there is in the nation's young people, countries improve youth employability. For example, in 2015, Microsoft invested in ‘Youth Spark’: a $75 million global cross-company initiative engaging with young people by increasing access to computer science education. Thirdly, the report says that that those at risk of social exclusion shouldn't be just that – excluded. Some countries high on the list, such as Canada at number 8, fund organisations to offer training and education programmes, while the US, at number 10, is directly providing work for low-income youths.